An early morning tip-off call led me to these scenes in Parliament Square. 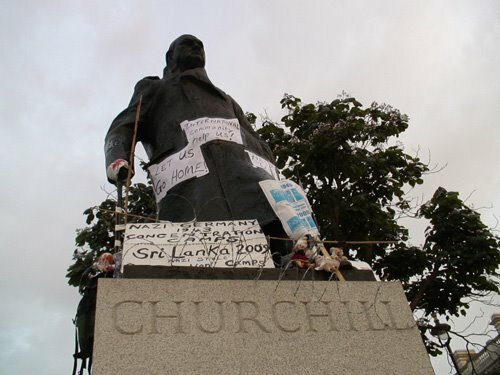 The Winston Churchill statue had been converted into a concentration camp – barbed wire, bloodied babies and bleeding injuries. 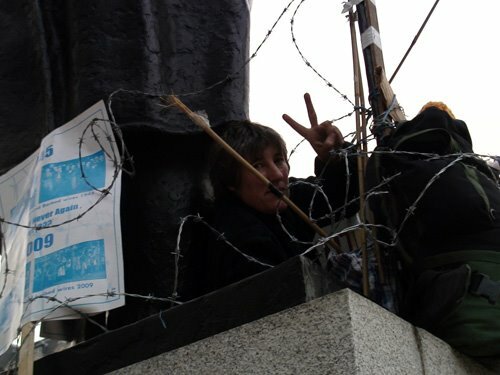 Peace campaigner Maria Gallastegui of Peacestrike climbed the two metre plinth in the hours of darkness to draw attention to the 280,000 Tamils, refugees from the Sri Lanka 60-year war against the Tamil Tigers, who are now held in refugee camps across the country. The Times reported 20,000 Tamils have been killed in the final assault on the Tamil Tigers. The refugee camps have been condemned by NGOs, aid agencies and worldwide governments. Channel 4 journalists who secretly filmed in one camp were immediately deported from Sri Lanka by the ruling government. Gallatesgui’s protest was meant to be seen by Prime Minister Gordon Brown, as he entered parliament for the weekly PM questiontime. But, according to Gallastegui, pressure from the house had her removed an hour before he arrived.